Okay, six teams left, and you know the drill. Running the now customary 1,000,000 simulations using this matrix gives us the probabilities shown in the tables below. The rows labelled "Fair" contain fair value prices and those labelled "Offer" contain the most-recent TAB Sportsbet prices. Double-asterisks denote those wagers that the simulations suggest represent value. 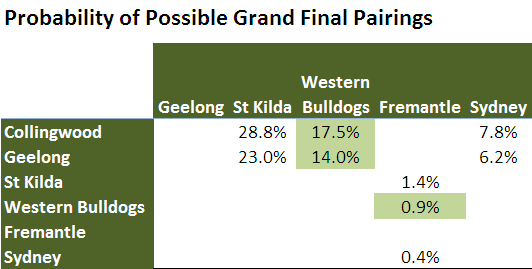 As has been the case for a while now, the simulations suggest that the Dogs represent value in both the Flag and the Plays-in-the-GF market. As well, the Cats are a value bet at $4 for the Flag; the simulations suggest that any price over about $3.30 for them represents value. In contrast, Sydney and Freo represent appalling value at only $13 and $41 respectively. You'd instead want about $30 and $125 respectively to feel as though you were obtaining fair value for this pair. Here, the value combinations are indicated by green shading, and all of the value bets involve the Dogs. Whether the Dogs are value bets or not all still comes down to the extent to which you believe that the Dogs' recent performances are the best indicators of their likely performance next week and, if they survive, in the weeks that follow.